The LM358 is a great, easy-to-use dual-channel opamp. Opamps have so many applications we figured we should probably carry at least one in a DIP package. 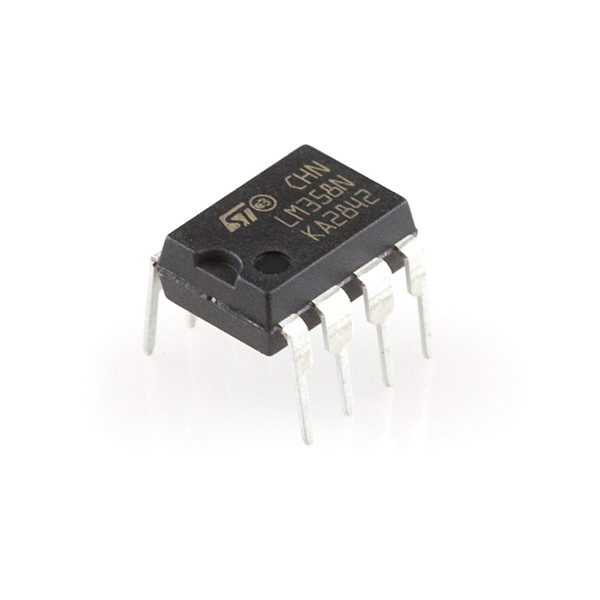 LM358 applications include transducer amplifiers, DC gain blocks and all the conventional opamp circuits. If you're looking for a good, standard opamp the LM358 should fill most of your needs. It can handle a supply of 3-32VDC and source up to 20mA per channel. This opamp is great if you need to operate two individual opamps from a single power supply. Comes in an 8-pin DIP package. Can this be used in an audio amplifier circuit just like any other op-amp? As in, can this be a replacement for a LM386 or similar. It would. but while you can use an LM386 to drive headphones or a small speaker, I wouldn't try the same with the 358. You could, but your maximum power is around 100mw. The main reason to use the 358 is that it runs on a single rail, and the output can swing from ground to like one volt less than VCC. I use it often as an active low pass filter to get low bandwidth analog outputs from PWM signals such as those from the Arduino. Ok, so then what on SparkFun.com could be used as a replacement for an LM386? (I couldn't find an actual LM386 here). Just a warning: The output does not go all the way to the ground. I measured 0.6V at 8V I- and 2.45V I+ 9V power supply. Hmm... I'd check for leakage, or maybe you got a bad part. In my current circuit, I have a low output of .14V and my input isn't quite 0V. Just checked this. With 0V input on the OpAmp, I'm getting .002V output from the LM358. How bad of an idea is it to use this with a pair of zener's and a high side current sense resistor? I'm guessing if the zeners match right (is that hard to get? ), then they could keep the high end of the differential voltage under the Vcc-1.5V ceiling of this op-amp and allow current control with an uninterrupted ground line. Anyone has used this one for a precision full-wave rectifier? You can take a look at the spec. sheets to get a good comparison, but the main difference between the LM358 and LMV358 is the supply voltage. 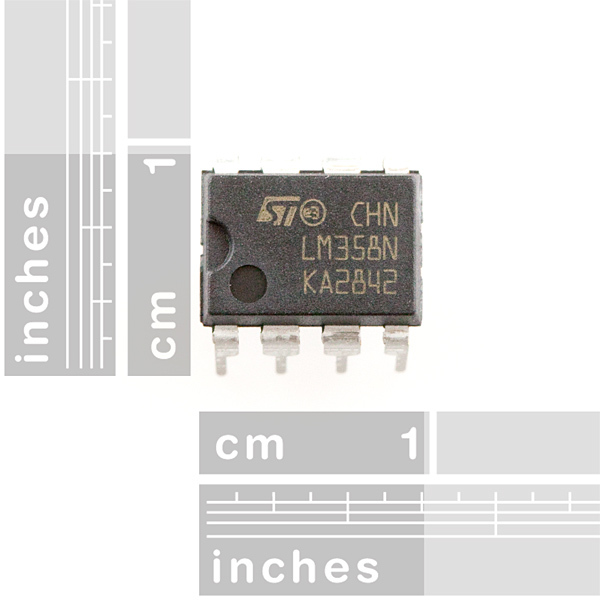 The LMV358 has a maximum Vss of 5.5V where as the LM358 can handle up to 32V. These are both general purpose low-power op amps, good for battery operated devices. Note that as low-power op amps they both have relatively slow slew rates (0.7V/us and 1V/us), meaning at higher frequencies the output becomes a triangle wave with decreasing voltage as the frequency increases. Check the spec sheets for frequency response info. Contrary to an earlier post I would not rate either as audio quality op amps as low slew rates result in distortion. EDIT: I have no experience with the LMV358, but from the spec sheet it has "performance specifications meeting or exceeding the LM358". They are probably close enough to be considered substitutes for each other. The input offset voltage is amplified along with the signal, that is why you will see a large output with no input. A 741 has offset null terminals. Connect the outer terminals of a 10k trim potentiometer from pin 1 to pin 5. Connect the center slider terminal of the trim pot to the negative supply voltage, or to ground. You really need to use both positive and negative supply voltages with the 741, unless the signal you are amplifying is a couple of volts above ground already. The 741 was not designed to work well with a single supply. In any case, for amplifying a signal this small, you will really want to use either a newer Op Amp with input offset voltage in the range of nV, find one with offset adjust terminals, figure out how to add offset compensation externally, or use a chopper amplifier. Yeah looking at the datasheet, the typical input offset voltage of this op amp is 2 mV, which is significantly larger than your input signal of .4 mV. It's the internal offset voltage that is causing Vout to go negative. You could try biasing the inputs to correct this, but I would recommend a different op amp. Could I use this guy to raise 1.5v to 5+v DC? On the SFE page it says supply voltage range is 3v to 32v but in the datasheet it says -0.3 to 32v under "absolute maximum ratings." Which is correct? I'm using the LM358 to raise the voltage output from a DAC connected to a Pi. The DAC has a max output of 3.3V (makes sense) and I'm using the LM358 to raise this to 10V for an LED control system. As Mike mentions, you do need a separate supply for the LM358 that is a couple of volts above your target voltage. Absolute maximum ratings tell you what will damage the part, not necessarily that it will operate within that range. You may know this, but if you haven't worked with op-amps before, note that this is not a power-supply chip that can change one voltage into another. It can indeed amplify/raise a 1.5V input signal to a 5V output signal, but you would have to be powering the whole chip with over 5V in order for that to happen. IS IT SAME LIKE lm321...I WOULD LIKE IT TO USE FOR CURRENT SENSOR GAIN....DO U HAVE ANY IDEA...I WAS REFERRING TO acs712 AND THE TYPICAL APPLICATION CIRCUIT.STATED THAT THE OP-AMP USED IS LM321. Can this be used in place of LM741 and LM311 op-amps? I would say definitely for the 741 and probably not for the 311. The 311 is actually a comparator, which is a slightly different concept, but op-amps can usually do double-duty as comparators. You may run into some trouble with the input voltage range and the output voltage- the 358 may not be able to drive the output as close to the rails as the 311 can. Also, the 311 has a much wider range of input voltages- +/-30V versus 0 to Vcc-2 for the 358. Where on SFE would I find the non-DIP op-amps? I did a search but could only find this. UPDATE: Please undisirregard this comment. You can find it on Digikey here.